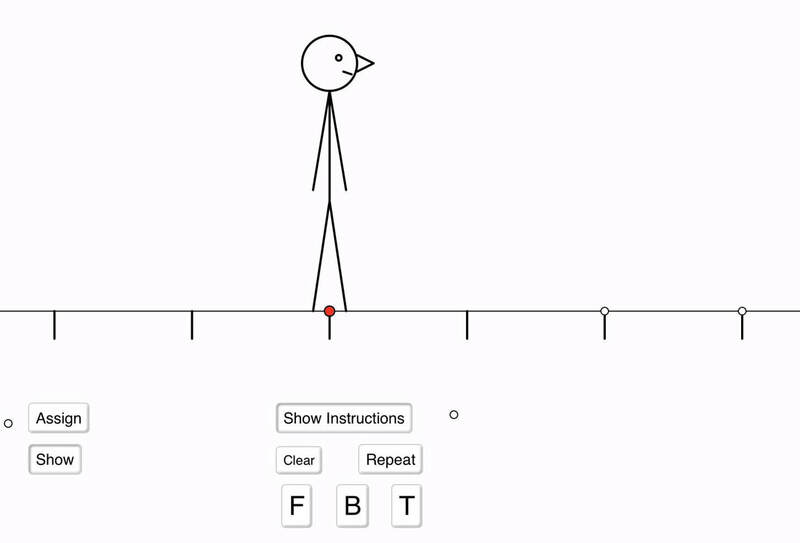 Initially this is a virtual version of walking forwards and backwards on a number line, in order to emphasise arithmetic as the study of actions of numbers on numbers. With the addition of T (for turn around) learners can begin to reason about the actions without recourse to doing it physically, and eventually, without enacting it virtually. Notes on applet use are included in these zipped folders. Going with the grain (down a column) provides variation of numbers. Going across the grain (along a row) provides variation of presentation. A second app in the folder presents a single row so that scaling is much larger. What is the same and what is different about these five calculations? Why? How might they be extended to the rest of the grid? If you have ever picked berries, or shared things out as a child, you may recognise "3 for me and 2 for the pot" or "3 for me and 2 for you"! What sorts of mathematical questions can you ask about this sort of situation? In how many different ways can you express the relationships between the number of blue, green and total after the process has been going on for an unspecified length of time? ​The idea is to introduce or to work on relationships between the language of fractions and decimals, both seen as actions on a set of objects. The applet permits choices of from 2 to 5 colours, in integer ratios. Given a number of counters, in how many different ways can you place them in the three regions formed from two overlapping Circles (sets A and B) so that there are the same number of counters in both A and B? What if the ratio is to be 3:2 for A:B? and more generally? ​What if there are three sets? A selection of cells from a grid have been selected (think of the other cells as having been covered-up). Their sum is shown. Make another selection, one cell from each row and columns. What is their sum? ​What happens if you cover-up all but two cells in each row and column? The applet supports constructing your own grid with a specified sum. What matters is the reasoning as to why, and why the construction works! Using ​to the left of, to the right of, greater than and less, and also closer to ... than to ... to work out a number on the number line. One deals with whole numbers; one deals with fractions, and one deals with decimals. One uses clues of the form "the number is ... much more than an integer multiple of ..." where the divisors can be chosen to have denominators from 1 to 10. 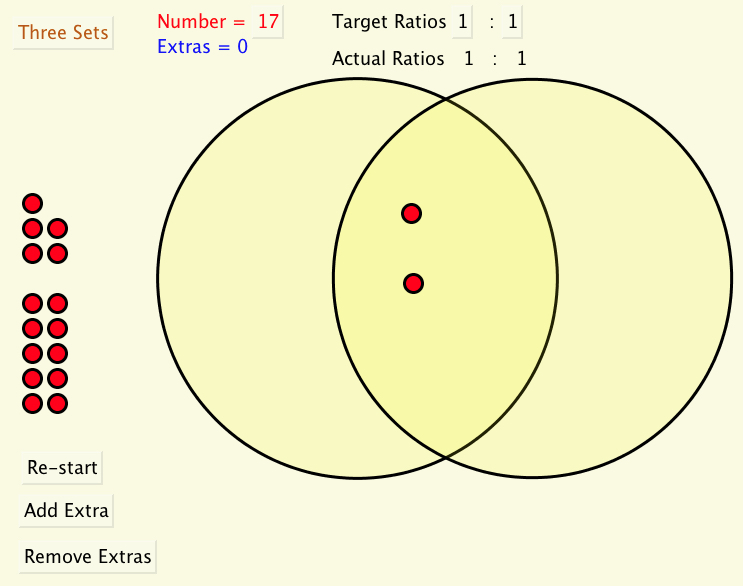 This applet is dedicated to the notion that multiplication in school is scaling, of which related addition is only one manifestation. The applet presents an elastic which can be stretched and contracted, while maintaining a copy of the original with which to make comparisons. The fixed-point of the stretching can be at the left-hand end, or somewhere along the elastic. 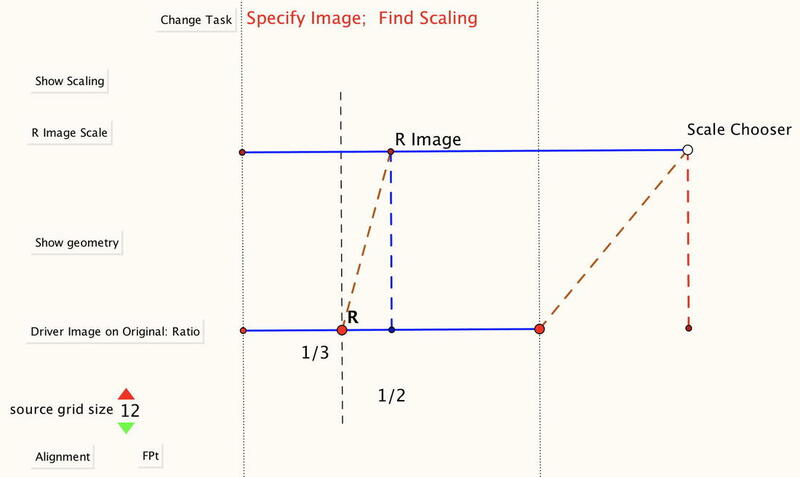 1) given a scale factor, where does an identified point on the original , when scaled, end up aligned with on the original? 2) given that an identified point on the original has needed up aligned on the original with some other point, what was the scale factor? By changing the fixed point, addition, subtraction, multiplication and division of fractions are involved. 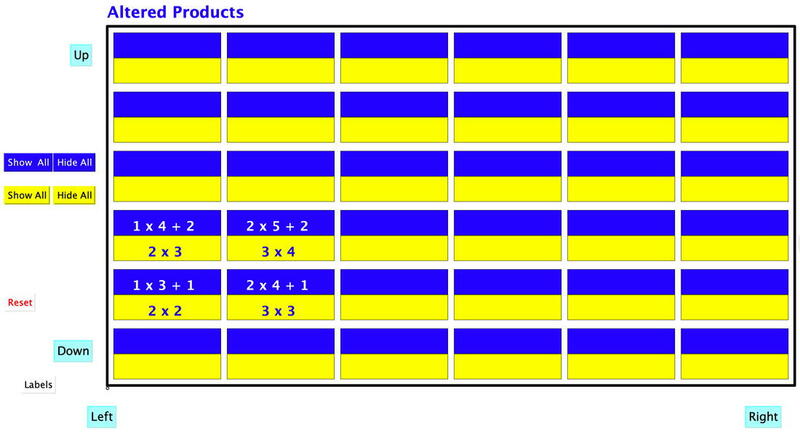 This is a Structured Variation grid based around some simple numerical facts about products of related numbers. The picture shows part of the grid with some of the entries filled in, from which all the other entries can be predicted. 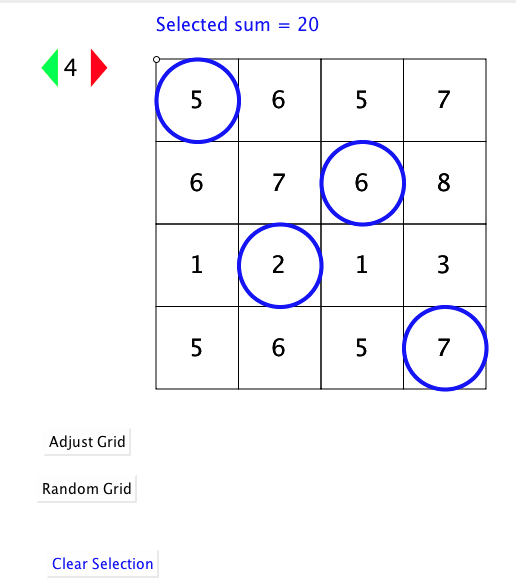 Working with the grid, you fill in entries by clicking having predicted.